Over the past several decades, many convertibles have cruised across the silver screen. While some go unnoticed, a few have become almost as famous as the stars of their shows. This 1971 Challenger featured on the hip Mod Squad show may have more options than any other 1971 Challenger in existence. Its unique look was built through its gold exterior and black sport stripes. The car featured chrome exhaust, a V8 engine, an automatic transmission, power disc brakes, a white interior and special wheels and tires. This beauty was recently sold at auction for $49,500. 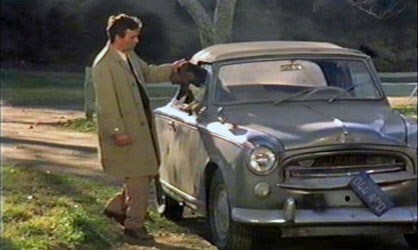 The Peugeot 403 Cabriolet featured in the Columbo series was an alter ego that emanated eccentricity. Although the vehicle seemed worn down, it gained plenty of fame. In no time at all, this shabby convertible became just as emblematic of the show as its bumbling lead actor. Columbo took his Peugeot to investigate the murders of the rich and famous, often landing it in settings that made its worn down quality stand out even more. There were actually several Ferraris made for Magnum P.I. and used during the course of the show, and they all had to be specially crafted to accommodate Tom Selleck's 6'4” height. Because of his height, most scenes filmed in the car had to be with the top down. The first season's vehicle was a 1978 308 GTS with no front hood vents or spoiler. In the second season, a 1980 308 GTSi with black headlight vents was used. The remainder of the series was filmed with a 1984 308 GTSi Quattrovalvole featuring hood vents and a spoiler on the back of the roof panel. The Monkees were known for their quirky uniqueness and popular music. Their touring convertible was a modified Pontiac GTO made by Dean Jeffries. In the area where the trunk was, a third row of seats was installed along with the original four bucket seats. There was also a parachute mounted on the rear, a split windshield, exaggerated tail lamps and modified fenders, giving the Monkees a GTO as unique as they were. That’s just a few of our favorite convertibles from television shows. What’s your favorite convertible of the silver screen? Let us know in the comments below! 1. Duesenberg Model J — Manufactured from 1928 to 1937, the Model J was one of the biggest, fastest, most expensive cars made during its time. With a motor based on Duesenberg’s popular racecar engines, this car had a top speed of 119 miles per hour. But it wasn’t just fast — the Duesy was elegant in a way most cars of its time weren’t. You can bet we’d be thrilled to snap one of these up if they made a revival. 2. British Motor Corporation’s MGB — For its time (1962-1980), the MGB had one of the most innovative designs available. This classic car balanced lightweight design with power, going from 0-60 mph in just 11 seconds. But the MGB wasn’t just powerful, it was also safe: The MGB was one of the first cars to use controlled crumple zones to protect drivers and passengers during an accident. 3. 1964 1/2 Ford Mustangs — Okay, so maybe you can still buy a Ford Mustang today, but the 1964 ½ Mustangs were something special. Released mid-model-year (thus the ½), these beautiful cars look like a ’65 Mustang from far away, but when you look closely, you’ll notice a world of differences that any true car aficionado can appreciate, from headlights to generator chargers. 4. Austin-Healey 100s, 3000s and Sprites — The lovechild of two well-known sports car makers, the Austin division of the British Motor Corporation and the Donald Healey Motor Company, Austin-Healey created some of the most distinctive convertibles from 1952 to 1972. These adorable two seaters were instantly recognizable from the front and the Sprite in particular became known across the US as the Bugeye because of the placement of its headlights. Bonus: Jaguar XK-E Roadster — From 1961-1975, these stylish convertibles ruled the road. They featured a notably long front and almost unheard-of speed, topping out at 150 miles per hour and boasting a sub-7 second 0-60 time. Luckily for us, Jaguar brought the Lightweight E-Type back in 2014 by making six more for established Jaguar collectors. What convertible would you like to see make a resurgence? Let us know in the comments below!